Adhesives are a broad category that include glue, cement, mucilage, or paste, and used to bind items together. The use of adhesives is much more advantageous than other binding techniques such as sewing, mechanical fastening, or thermal bonding. Adhesives are typically organized by the method of adhesion as reactive and non-reactive adhesives. These can also be classified as natural or synthetic. Adhesives are classified in a variety of ways depending on their chemistries, i.e., epoxies, polyurethanes, polyimides, their physical forms like paste, liquid, film, pellets, tape and how much load they can carry. These adhesives are strong adhesives and include epoxies, cyanoacrylates, certain urethanes and acrylics. Such adhesives can carry significant stresses, and find use in structural applications. These adhesives are low modulus elastomers which deform easily under small pressures, permitting them to wet surfaces. Pressure sensitive adhesives are available as tapes or labels for non-structural applications, and sometimes as double-sided foam tapes for use in semi-structural applications. These adhesives come as two-part forms that are mixed carefully to get the final product or also as one part forms. Mitre Adhesive kit is a high strength bonding system that has a cyanoacrylate composition. It comes with an aerosol activator to ensure full and rapid curing on acid surfaces. Mitre adhesives have a wide scope of application and can be used for bonding MDF, wood, rubber and most plastics. Assembly time in mitre joints is reduced because it bonds quickly, ideal for precision bonding and cures in approximately 10 seconds. Mitre Bond is a 2 component system consisting of adhesive and activator. The activator can also be purchased in a pen format for precision. Mitre adhesives are amazing instant adhesives that stick fast and hold forever. It is versatile and instantly binds almost anything, even completely different materials. It can easily bond glass to metal, stick wood to aluminum, attach acrylic to granite, join rubber to ceramic, wood to wood and hold fast. Mitre adhesives are quick and easy to apply, ready to use and sets in seconds. At Buildworld, we stock the Mitrefast bonding kit from Everbuild that gives you instant adhesion with zero mess. 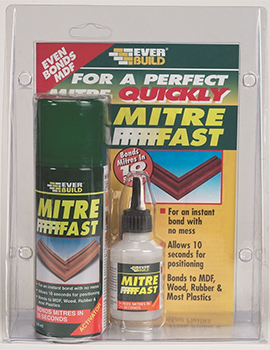 Mitre fast bonding kit from Everbuild is widely used in the field of furniture making, plastics, picture frames, MDF joinery work, worktops and many more areas.